This wine was fermented in open-top vats and then left for an extended maceration of 2 month. The wine was then pressed and immediately racked into 50% Canadian oak (fifth fill) and 50% American oak (fourth fill). After 10 months, the wine was racked out of the barrels, blended, and bottled. The nose shows notes of cherry, red currant, and forest floor, with toasted coconut notes from the Canadian oak, butterscotch tones from the American oak, and apples and spices on the finish. 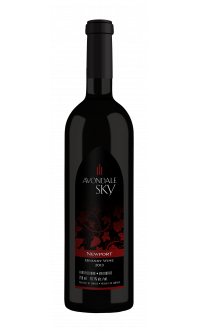 The palate is medium bodied with a balance between fruit and spice, alcohol and acidity. The wine finishes long with mellow tannins that pair perfectly with pig.